Guten Abend, drei menüs bitte, ich gehe unter zehn, wir sind sie? 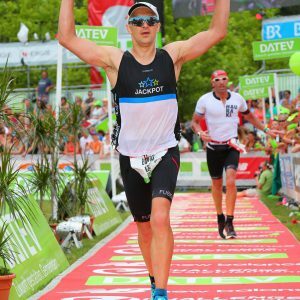 Yes folks, a trio of Jackpotters were out on the continent visiting Bavaria, and practising their German for the Ironman distance event Challenge Roth. 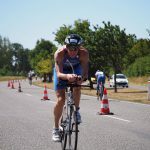 The event is celebrating its 30th year and renowned as the most spectated of all ironman events with around 250,000 spectators lining the course. The region was experiencing unusually high temperatures for this time of year which resulted in the organisers airing caution to all competitors at the race briefing ahead of race day. However Mark Kilner, Eddie Howarth and myself remained calm. On race day the temperature did not feel as hot as first expected, however tan lines were still pristine by the afternoon and temperatures in excess of 30 degrees. 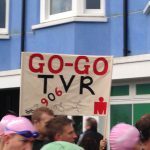 On arrival to T1 and the swim start athletes were greeted with a very reserved atmosphere where last minute adjustments were made to bikes and equipment as a collaboration of songs from Hans Zimmer and John Williams from War Films were played over the sound system. The tension was mounting and at one point it became a little too much until i saw Mark Kilner in his wetsuit! The start of the race and departure of the Pro field was singled by canons and hot air balloons rising above the waters, following some more (thankfully) motivating songs such as eye of the tiger….I was getting pumped and ready to go. 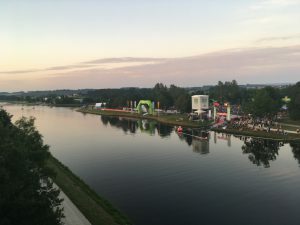 The swim was held in the warm waters of the shipping canal running through the Bavarian forest. The conditions were calm and athletes given 5 minutes between more cannons signalling the next wave. Eddie Howarth led the Jackpotters out the of the water first in 55 minutes chasing down Mark Kilner (swam in 1:09) who had set off 20 minutes earlier behind the pro field and chasing a potential sub 10 time. I later followed in a slower than expected time of 1:18 and the garmin reading over 4100 metres covered. With plenty of assistance from the superb volunteers in transition the trio exited, organised and then acclimatised themselves to the smooth German roads. Early into the bike leg Eddie Howarth hounded down the fox Mark Kilner as he howled past… no literally. The bike course was a spectacle with undulations and the passing of villages and towns saw locals turned out to cheer and enjoy the festival atmosphere. By the end of the first lap the athletes approached the famous Solar Berg hill where spectators crammed the roads with riders only able to pass single file with the crowd cheering and screaming only inches away. Unable to see how Mark and Eddie were doing I stuck to my race plan with a clear strategy of pushing a little on the hill and getting up to speed on the flats and descents while keep as much speed in Valentino Rossi riding style! The temperature was starting to heat up and the wind becoming more evident on the tiring legs. Four hours into the bike and I was beginning to get saddle sore and a little lethargic I continued to eat and drink religiously to the 5km splits on my Garmin and took some caffeine to raise my alertness. At each aide station I took on some water having carried my well honed rice cakes and blended isotonic recipe drink from T1. After the two loops there was a 5km service road to T2 where the riders where stretching out and looking forward to leaving the bike leg poised for their run. Eddie was off the bike first with a solid time of 5:07 followed by Mark with back and hip problems flaring and a below par ride of 5:49, and then myself catching up Mark in a well executed bike time of 5:30. 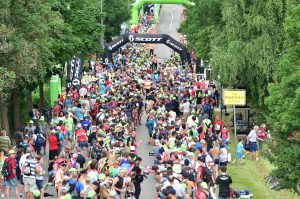 This year challenge Roth had changed the run course to incorperate effectively two out and back loops providing spectators with at least four occasions to see each athlete pass. 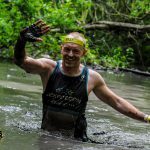 In turn this brought a challenging marathon run through forests and trails in the 30+ degrees temperatures and over 650 metres of elevation. 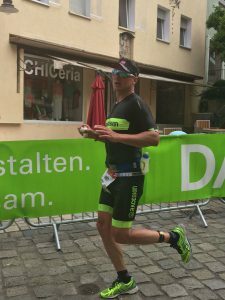 Fortunately, locals, family and friends cheered the athletes through the final stages sitting on German garden tables drinking Steins of beer and again fantastic volunteers provided a buffet of refreshments and nutrition along the route with the multiple aide stations. Out on the run and the heat was evident straight away, with aide stations first offering water sponges then water. On leaving and climbing the trails of the forest section and heading out on the canal paths the sun was beating hotter and hotter and each aide section became about reducing temperature, maintaining hydration and nutrition. The first 5km was a shock whilst my body got into the running and my mind was telling my legs to shut up. In the second 5k lethargy crept in and the race became a struggle. 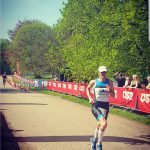 With no Greggs in sight I turned to other nutrition taking on caffeine gels and more coke becoming alert and finding rhythm over the next 20k. I continued taking on gels and fuel regularly and towards the last 15k, the Redbull and salts kept me moving. On calculating that I was well within the sub 12 hour mark I began to pace myself home with achilles, knee and shoulder pain contributing to the crowd of messages I was getting from my body to stop. I pressed on. With the out and back course I constantly kept a look out for Eddie who was progressing well on the run and Mark who was still having a bad day in the office especially when I caught him with less than 10k to go. Andy Jackson (jackpot newbie), Colin McNeil, Phil Berry and Kev Heath from Raceskin were all exchanging encouragement as we passed, and on seeing the trio of home support (Georgina, Julie and Jo) proving to be more emotional on each passing. Well before i approached the last 10k Eddie had finished with a 4:03 marathon and overall in a time of 10:14:57. Chapeau. With less than 1km left the turn was made for home stretch into the Roth Expo and the 10,000 seat finishing shoot which was shaped like a horse shoe. Trying to find some composure and technique in those tired legs while thousands were watching me take my last strides became even more difficult with the ruffled red carpet, on what felt like a motocross course under my blistering feet. Minutes earlier Mark had salvaged his race, from 5 km away from finish he was meandering in front and swaying from side to side through the forest. On refusing an ambulance (Golf Buggy assistance) Mark claimed he was Yorkshire’s Bruno Tonioli. On doing this and refuelling with salt and Redbull he sidestepped and found some rhythm with those hips to finish the marathon in a time of 5:04 and overall with 12:07. On me entering the stadium Eddie had already finished and had consumed two Steins of Erdinger and cheered myself and Mark home with the Jackpot Support crew. I was delighted and emotional at the end to finish in 11:42:23. Well what a fantastic event and a definite “bucket list” experience with nostalgia, excellent organisation, amazing support and humbling volunteering. If you have not done Challenge Roth make sure you added to your list. Thanks to Mark, Eddie, Andy and everyone who made Roth 2017 a fantastic day.